Then it got the 355 SBC and then a like new T-56 from a 94 bird. The 355 is well worn, but has forged pistons and is balanced. It also recieved the near brand new Dart S/R heads w/2.02-1.6's I had on my last motor. This 85 only weighed 2800 lbs on the scale (checked on 2 scales same hour), add Brian and it is an under 3000 #'s! The funny part is the car hooked just as good on the street as the track. On the dyno just before I sold it made 435hp. The Force EFI hardware was controlled by a modified old analog projection TBI box, but is now controlled by Accel DFI Gen-6. 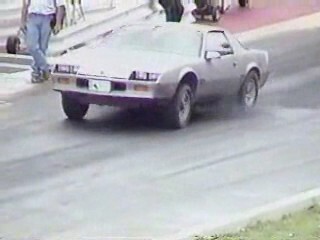 I originally sold it to Brian Blanton because he was at my house for the build-up so he knew the whole car well. It is the only car I really miss. Family concerns made him lose interest in it and sell it to Mike, so I doubt I will ever be getting it back. Download original video right click - "save as"
Fresh 28 x 10.5 ET streets included Car weighs 2800 pounds without any lightening yet!